We propose here a workable moral strategy that would put “everyone” back to work; bring peace and stability; end war-sacrificed lives; and ensure corporate profits, growth, and cooperation; and would allow people to return to peaceful opportunity-laden homelands. The sun was rising, only a few clouds; prospects for a good day ahead; but August in Japan — this was likely to be a hot day. With quiet thoughts to themselves and of family members living in Hawaii and on the American west coast, some, very hungry, were optimistically expecting the war to end soon. That Day: August 6, 1945, 8:15 AM: In the center of Hiroshima, just above Shima Hospital, it seemed like the sun had descended to the earth, followed by the sky blasting down in a Richter-10 cosmic quake from the gods, “rattling the earth’s axis,” scorching, searing, roasting, irradiating, blasting, and crushing everything and everyone below. The sun touched Hiroshima, a blazing inferno with no escape; nuclear radiation made people’s bones radioactive, blast winds in excess of 200 mph. The blast overpressure blew out ear drums and forced eyeballs out of their sockets (exophthalmos), hurled and slammed people into walls. Scorched blistered skin sloughed and peeled off their bodies and dragged on the ground as they tried to escape. The retinas of eyes looking up were burned. Stone and concrete buildings were fire-gutted to their cores, the blast-shattered glass window fragments sharply tearing into the bodies of those within, and without. 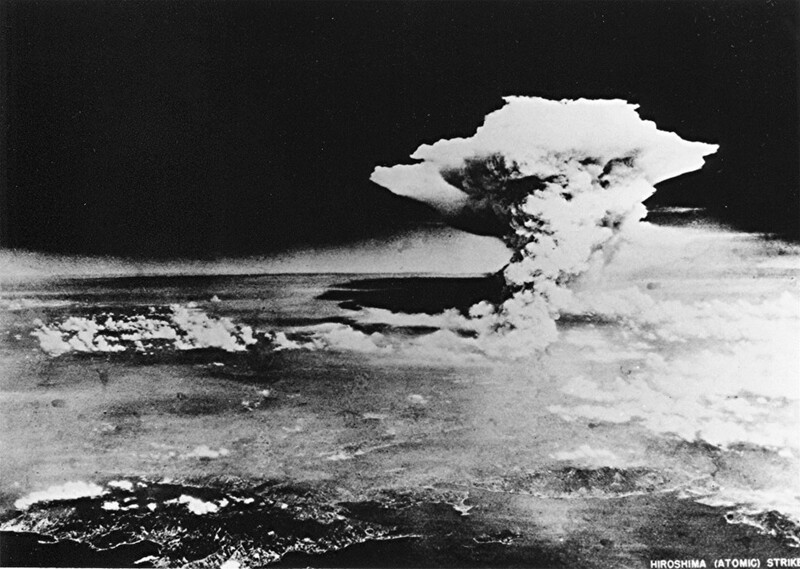 This happened to Hiroshima citizens within seconds on August 6. Birds and butterflies never had a chance. On August 7 the Mayor and whoever else he could find, had to deal with 70,000 dead under their crushed burned homes and heaped and strewn all over the streets, bridges, and river banks of Hiroshima. Over the next two weeks more people would die, day and night, averaging 160 per hour. Radioactivity was all over the center of the city. Thirteen square kilometers of homes, stores and shops destroyed. One small and primitive nuclear bomb, the equivalent explosive power of 16,000 tons of TNT detonated over the city of 350,000, emitting a huge flood of nuclear radiation. By Dec 31, 1945 the death toll was about 140,000 and the counting could not stop then. Hiroshima City was wiped off the earth. More than 140,000 people, mostly civilians, disposed of as ashes and smoke. Hiroshima City, population 350,000: below the cloud were some 200,000 trapped by the fire, destruction, and fatal injuries. 70,000 dead by August 7, about 140,000 dead by December 31. August 9, 21,000 tons destroyed Nagasaki and its people, killing another 70,000 by year’s end. By hindsight and knowledge later gained from surviving Japanese government officials neither bomb was necessary to bring about the end of the war. Sumiteru Taniguchi, age 16 in 1945, was the only one of 28 postmen in his group to survive. He was a mile away from the Nagasaki hypocenter. A mile away from this small nuclear bomb was not far enough. Since 1945 there have been no world conflicts which could have justified the use of nuclear weapons. Will there be any upcoming conflicts with our major trading partner, China? Will there be a war because Russia (usually a US trading partner) illegally annexed Crimea, etc.? Are there any American politicians, any “decision makers” or “deciders” that would use nuclear weapons to “correct” international conflicts? Is there anyone in the world qualified to make such a decision? “There will be no peace. At any given moment for the rest of our lifetimes, there will be multiple conflicts in mutating forms around the globe. Violent conflict will dominate the headlines, but cultural and economic struggles will be steadier and ultimately more decisive. The de facto role of the US armed forces will be to keep the world safe for our economy and open to our cultural assault. To those ends, we will do a fair amount of killing.” (Major (P) Ralph Peters of the Office of the Deputy Chief of Staff for Intelligence, 1997, where he was responsible for future warfare (retired as Lieutenant Colonel in 1998). “The powers of financial capitalism had a far-reaching [plan], nothing less than to create a world system of financial control in private hands able to dominate the political system of each country and the economy of the world as a whole.” From Tragedy and Hope: A History of the World in Our Time, 1966, (1359 pages). Who authorized that “financial control”? Let us attempt some “new ways of thinking,” based upon human and moral interests. Consider the following: It must be true that in an ideal peaceful world, a world without the conventional weapons of war, without tanks, missiles, bombers, warships, drones, there would be no need for nuclear weapons, so-called weapons of mass destruction, weapons that treat people like matter. A world without conventional weapons of war, and thus no need for nuclear weapons, could that be achieved? The world initiatives for action need to be stripped away from the military industrial establishment and also from the war mongers with their insidious subversions, their mythological belief in their superiority and destiny to rule the world. World initiatives need to be directed toward peace, not war, for all those nations which are ready for peace, ready for the promised advances of the 21st century. At present U.S. foreign policy is subverted by events abroad, events over which we have little control. What shall be proposed: would put “everyone” back to work; bring peace and stability; end war-sacrificed lives; and ensure corporate profits, growth, and cooperation; and would allow people to return to peaceful opportunity-laden homelands. The United States announces a strategy, that starting one year from now it will revise the manner by which it provides aid to all other nations and particularly to those of the Less Developed world, provides aid using American taxpayers’ wealth. It will no longer be direct aid. All other Developed nations are encouraged to similarly participate so that they can also obtain the benefits which will accrue to them just as benefits will accrue to the United States. Affordable? On April 10, 2009 the small nation of Japan, not at war with anyone, announced a $150 billion government stimulus package. In 2009 Japan thought it could afford to do this. I can hear a conservative United States Congress shouting that we cannot afford to do something like that. But financial resources are always found for wars. We can be smart enough to find them for a peace which eliminates wars and the costs of wars. July 27, 2016, Japanese Prime Minister Abe announced another economic stimulus package, this time, $265 billion. In August, 2016, P.M. Abe pledged that Japan will invest $30 billion in Africa by 2018. We can show that this workable strategy will lead to more than 500,000 U.S. peacetime manufacturing jobs in the first year, and more than 500,000 other peacetime jobs throughout the world. The United Nations makes the “credit chits” available to peaceful democratic nations of the Less Developed world. To help them along the way chits will also be very cautiously offered to those nations which are verifiably peacefully evolving toward equitable nondiscriminatory constitutional democracy. The chits are made available to Less Developed nations on the basis of solicited application of: development proposals from them, verifiable need, and guarantees against misuse or corruption. 6) education and training at all levels to support items 1-5. The solicited development proposals submitted to the United Nations by Less Developed nations will be carefully evaluated, in terms of the proposed societal, cultural, economic, and environmental impact, and in terms of protection against abuse and corruption. Unacceptable proposals shall be returned for revision until they are in line with this UN sanctioned strategy. The UN will aid revisions. The United Nations, administering this program, will not grant chits to nations where war exists or is likely or where violations of rights: gender, religious, human, or ethnic, are active or not being remediated. Repressive and military governments and martial law governments will not qualify for participation in this program, nor will any nation, chit donor or receiver, regardless of its power and influence, which is not fully and actively transparently participating and cooperating in the worldwide elimination of: armaments of war, nuclear weapons, terrorism, and the illicit drug trade. In democracies seeking peace and advancement what will the people choose? All the above is the essential specification to this workable moral strategy for achieving and preserving world peace. There are three additional “recommendations,” in Chapter 5 of the author’s book from which this document has been extracted and abridged. See note at end. There will be great advantages to all nations who make chit deposits into this program, and considerable disadvantages to those who can, but do not. 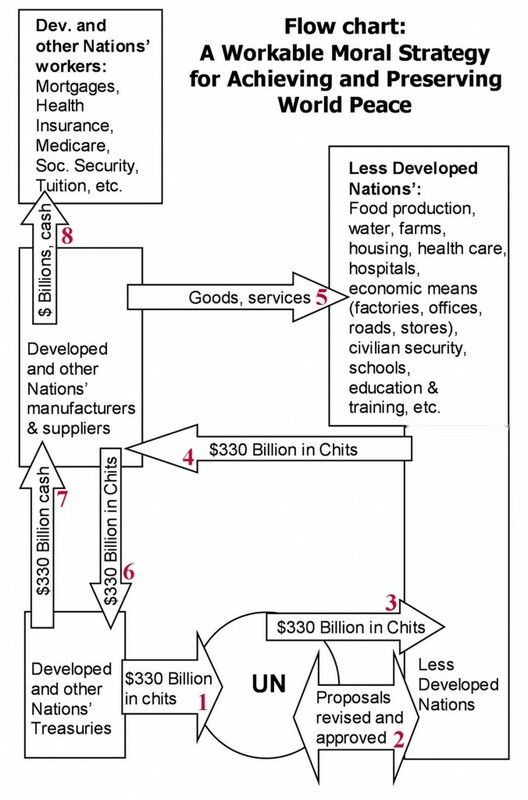 The more chits deposited, the greater economic value accrues to the depositor nation. It should be obvious. —The entire world could have full economic recovery, elimination of the possibility for international nuclear catastrophe, and the practical elimination of war. —In a world at peace the refugee problem is solved. The killing stops and solutions to world-wide problems can be found. The basic tool is cooperation and proper incentives, not sanctions, boycotts, and deadly threats; justified benefits, not penalties; advantages for all. As promised, no money would leave any nation or pass through the UN, and the credit chits never pass through the World Bank, or any bank, or the International Monetary Fund. Justification: A Moral World View— Does the Developed World and its people have any responsibility for the conditions of poverty, starvation, slavery, disease, displaced refugees, rights deprivation, war and killing, and illiteracy, etc., as they now exist in the former colonial and Less Developed world, in Africa, in Asia and the Middle East, in Latin America? Over past centuries has the Developed World exploited the people of the UnDeveloped World? Have you and your nation taken selfish advantage of people of the Less Developed world? If so, does the Developed World have any unfulfilled moral obligations to the former colonial and Less Developed World? Adoption of this Incentivization of World Peace would go down in history as the turning point which saved the earth and its people from the return to the darkest ages. For all nation’s Congresses and Parliaments it would symbolize the wisdom of finally coming to their senses. When nations are at peace, they advance. It should be obvious. Raymond G. Wilson is an emeritus Associate Professor of Physics, Illinois Wesleyan University, and has taught about nuclear war for over 57 years. 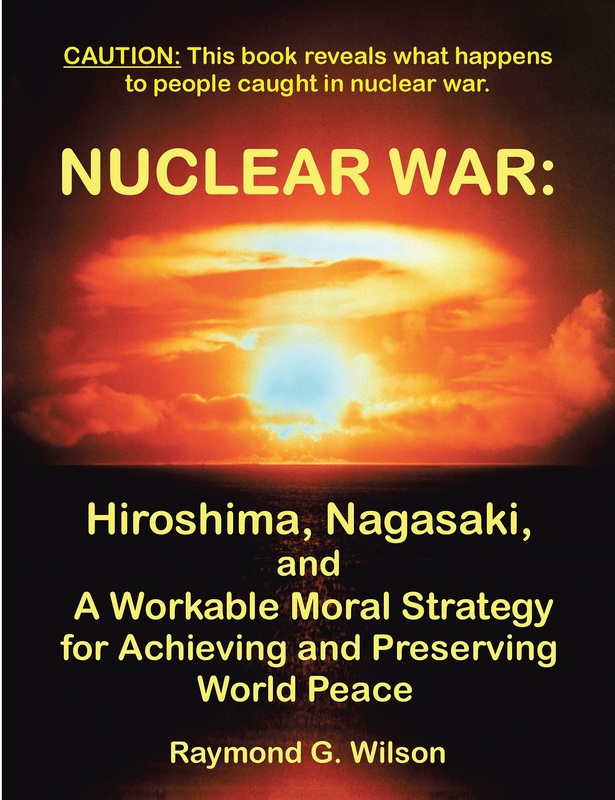 This brief adaptation of the peace plan is from Chapter 5 of the author’s book, Nuclear War: Hiroshima, Nagasaki, and A Workable Moral Strategy for Achieving and Preserving World Peace, 2014. There is a “Caution” on the cover. The PDF book download is available at no cost here, http://sun.iwu.edu/~rwilson/PNDclass.html. By Blash on May 16, 2016. This book is a must read for anybody that has the slightest interest in the events of Hiroshima and Nagasaki. The author’s knowledge is one of the deepest I have ever encountered on the topic. Also, the recommendations for a sensible path moving forward are very much worth the read. Highly recommend. By Gerome G. Torribio on July 30, 2016. This book is a valuable update to the literature of the unthinkable—nuclear warfare—that began with John Hersey’s iconic Hiroshima. Given the current level of international conflicts and tension, plus the efforts of the U.S. and NATO to move beyond the decades-old Mutually Assured Destruction balance of terror with Russia by installing anti-missile defense systems around the world, thinking Americans deserve a reminder that nuclear war is a ghastly, civilization-ending possibility that goes beyond any special effects that Hollywood can create.